It's no surprise to anyone who has read posts on here when I say that I really enjoy train games. Usually it's the lighter fare - Ticket To Ride, Chicago Express, and the like - but I do enjoy a nice heavy one occasionally. I still rank Age of Steam in my top 5 games of all time. 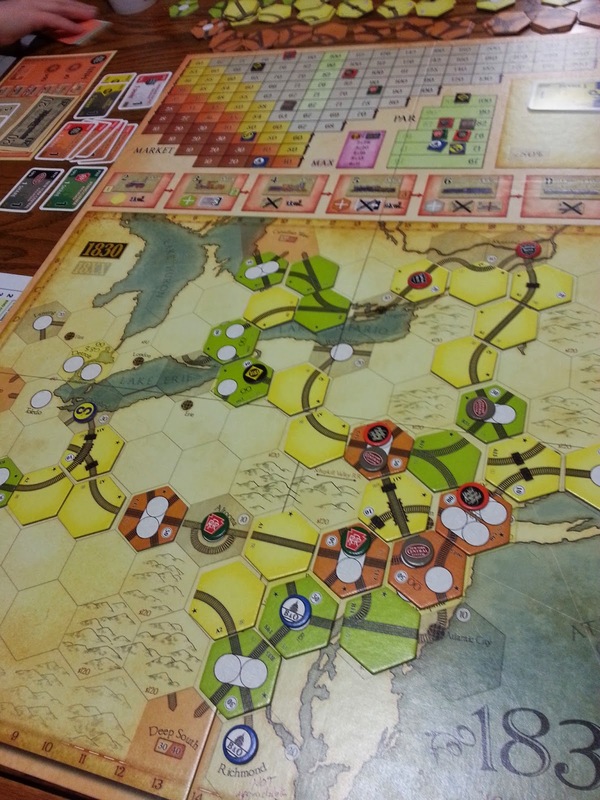 Well, there is an even bigger class of train games referred to as the 18XX series which I had yet to really play up till last night. They are notoriously complex, lengthy, and usually devoid of luck as far as I know. Having read about the different versions (all representing different eras and locations), it seemed 1830: Railway & Robber Barons would be the "easiest" intro and the most enjoyably cutthroat of all of them. Shockingly, I was able to gather 5 others to give up an entire day (8 hours!) to learn and play the game. Perhaps even more shocking is that every person loved the game and is already talking about when we can play it again next. It's pretty clear after one play that the next game would run closer to 5 hours as the rules explanation alone took an hour. 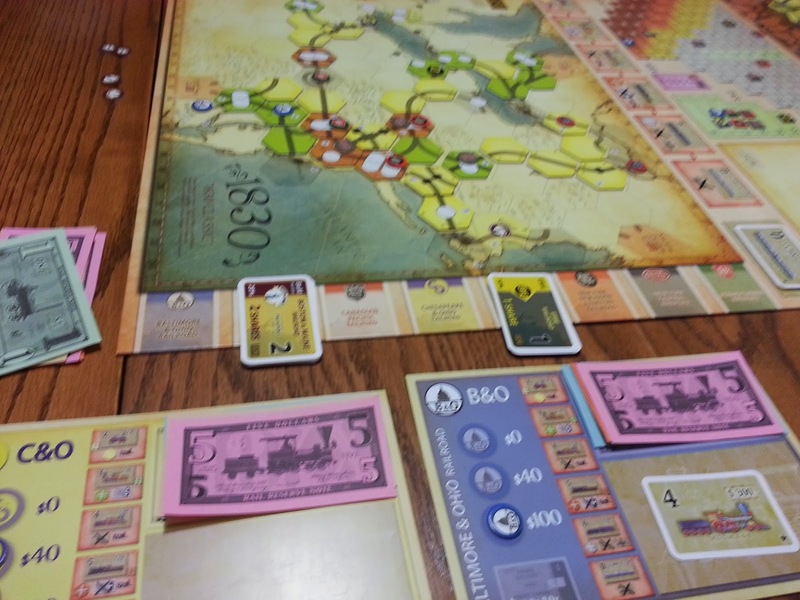 The game itself can be described as a stock market investment game crossed with railroad track building. Players buy stock in the 8 different railroads and whoever has the majority stock in each makes all the decisions in terms of track-laying and station-building. It's one of those games where one can do quite well without controlling a single company. In addition, players can play some pretty vicious tricks with the stock market sales to drive stock prices up and down to gain and lose majority control and sink an opponent's company. There is a lot going on and a somewhat convoluted 30-page rulebook but it never seemed overwhelming as most of the rules just seemed to make sense. Honestly, learning Through The Ages was way tougher the first time and took just about as long. It's a testament to the greatness of this game that after an 8-hour marathon everyone wants to play it again ASAP. I definitely do. 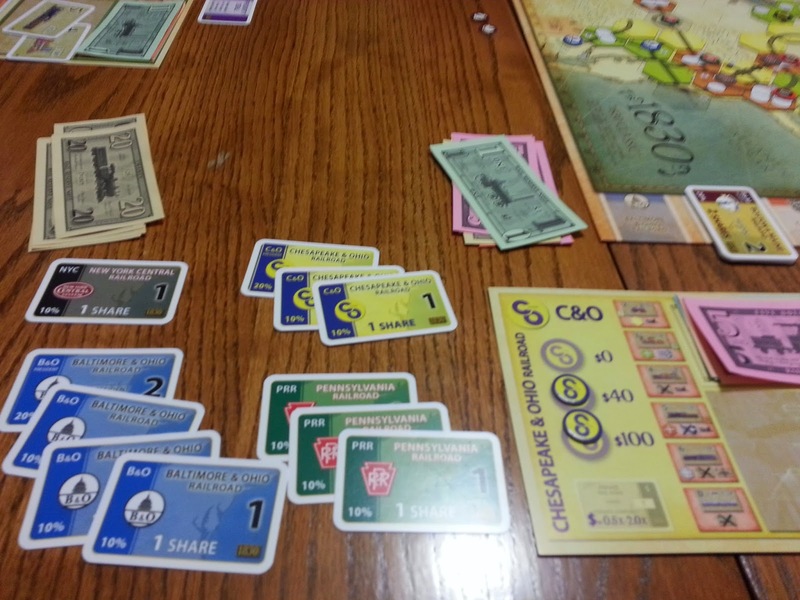 I staved off bankruptcy only barely and ended up losing by an atrocious margin. Still loved every moment of it.